J.S. Skye grew up in the Midwestern region of the United States. At a very young age, it was apparent that he was very talented. Finding that he was gifted in music and art, he plunged himself into both. As time passed, he set aside music to focus even more of his attention on developing his skills as an illustrator. All throughout his years in school, J.S. Skye spent every available moment creating and developing fictional worlds. Caring about realism, he developed multiple people groups, countries, worlds, and even languages. His fictional realms were created through both written and visual mediums. After traveling to almost a dozen different countries and studying different cultures, J.S. Skye decided to implement his interests in ancient cultures, history, languages, mythology, and more into his writings. He decided it was best to pour his heart and passion into writing instead of having divided interests between both art and literature. J.S. Skye has accumulated a fairly large collection of his various writings. These stories range from all types of different genres such as mystery, science fiction, fantasy, and even horror. Friends encouraged the aspiring writer to produce a novel and see how things progressed from there. J.S. Skye's first novel, The Granted Wish, was met with cheerful affirmation. The positive feedback was overwhelming and unexpected. Fans of his Flurry the Bear novels grew and began to clamor for more. From this point forward, his first novel series came to be. The Assassin's Pact: Flurry the Bear, Book 6 by J.S. Skye is a continuation of the story of Flurry and his family. Before I even begin talking about the novel and the story, let me just say that the covers of this whole series were simply amazing. I am in love with how detailed and descriptive they are. Now on to the story! The story follows Flurry and his friends. It has been two months since they have defeated the evil pirate and his crew. Now all they have to do is find a way back home. However, finding their way back home is not as easy as they would like to think. It is high time that this furry family starts thinking like a team and think of a way out of this mess. The way back home is paved with danger and dangerous creatures that are intent on destroying them. They are attacked by a group of cats who seem to be working with Isangrim, the wolf. He is a strong villain who is after Flurry. Now, it is up to Flurry to find his way back home and do it without losing or injuring his brothers. Can he do it? Can they all get back home unscathed? Intense, entertaining and filled to the brim with action, this sixth novel in the series brings the beloved characters back on an adventurous journey. I loved Flurry; his determination and his ability to take charge have improved. He is now more responsible in the face of danger and I loved him for it. Once again, the characters were given page space to grow and become stronger. The villains were believable and Flurry and his furry brothers were adorable. A brilliant story. 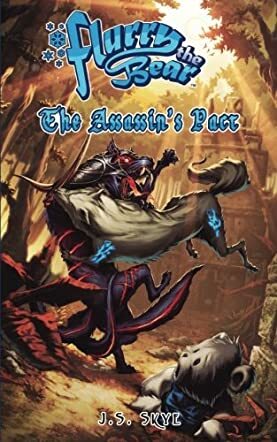 The Assassin's Pact: Flurry the Bear, Book 6 is an epic fantasy novel for children and preteens written by J.S. Skye. Boaz, the lion, isn’t all that impressed with what he sees as Flurry’s great and daring rescue of Shinyuu and the other captives whom Naphal and the Gatemakers were preparing to drag through a black hole into their own dimension. Boaz sees it as showboating and wanting to be the center of attention, but Drizzle believes that Flurry really does care after all. As the Fuzzies and their companions make their way back to Ursus, each has been forged into bigger, more authentic versions of themselves as a result of their adventures. But Boaz feels belittled and betrayed by the fact that Honja, the little rabbit, really knew their language all the time even if he never used it. All the effort Boaz made to learn Honja’s own language seems to have been useless and unappreciated. Honja had always been frightened of speaking their language, fearing ridicule for making mistakes, but Boaz had to realize that about his former friend. Caboose now had protective armor which was perfect for the little polar bear who was apt to fall into the most precarious of situations. Boaz was now the organizational genius of their small team, the holder of gold and navigational devices, and the tall lion, Noah, had become highly proficient at using a staff for protection under the tutelage of Chingu, the red panda. Drizzle had yet to tell the others that he wouldn’t be going home again. His place was now at Chingu’s side. He would be missed by Flurry and the others, but they could understand how he had made that choice. Flurry had also been greatly changed by the experiences he had survived and the battles he had been part of. He was no longer the pampered, vain and self-centred teddy cub who adored pirates. Flurry was growing up. Still, however, the Fuzzies were oh so eager to see Mommy again and to feel the comfort and warmth of their bedroom at home. J.S. Skye’s epic fantasy novel for children and preteens, The Assassin's Pact: Flurry the Bear, Book 6, finds the Fuzzies more than ready for the security of home, but another adventure awaits them on the way. There’s magic in this series that somehow gets the reader so involved in the struggles and triumphs of Flurry, the Fuzzies and their other companions that one actually forgets that the main characters are stuffed plush toys. They’ve magically grown into living, breathing creatures who, through the course of this series, have begun the process of evolving into their best selves. Most obvious is, of course, Flurry, whose legendary exploits jar in the most gentle and humorous fashion with his obvious lack of vocabulary skills. Book 6 builds beautifully on the previous books in the series, but one can also detect the influences of Homer’s Odyssey and Tolkien’s indomitable hobbits in the spirits of these stalwart companions and their longing for home and hearth. The story is action-packed and filled with the adventure Flurry fans have come to expect from this series. Dare one hope for more Flurry adventures? This reader certainly does. The Assassin's Pact: Flurry the Bear, Book 6 is most highly recommended. The Assassin’s Pact is book 6 in the Flurry the Bear series by J.S. Skye, a hypnotic narrative involving a compelling cast of bear cubs. Flurry and his brothers have just defeated the dreaded Black Bear’d and his crew of pirates, and are now on their way home. But this isn’t going to be an easy journey because they are faced with even graver dangers than those they just overcame. They are ambushed by fierce and dangerous feline assassins who are bent on eliminating Flurry. But these felines are just the tip of the iceberg, because the most dreaded adversary, Isangrim the wolf, is getting ready for a very dangerous assault. Can Flurry and his team muster up enough courage to defeat such an enemy? Readers are again plunged into a pulse-pounding story, packed with nonstop action and featuring characters they will root for. This is a story that will entice young minds and bring a lot of delight to mature readers as well. In a captivating setting, J.S. Skye’s writing is cinematic, laced with arresting visual images and intense action. Here is a story that brilliantly showcases the strength of teamwork and features characters that take responsibility for their destiny. It will be a great delight to fans of animal tales and pet lovers. The story is told in a voice that hypnotizes and it is interesting how the author confers human values and qualities upon his characters. The Assassin’s Pact will have the reader riveted from the first to the very last page. The Assassin's Pact by J.S. Skye is the sixth book in the Flurry the Bear series. After defeating Black Bear'd and his pirates, Flurry and his friends are finally ready to make the return home. When their journey is ambushed by a pack of felines, they discover a startling alliance with their former enemy, Isangrim, and his wolf pack who plan to enact revenge against Flurry and Vallidore. As they fight for survival, Flurry discovers a startling revelation that could prove to be more dire than anything they've faced before. Flurry must band together with his friends to stop Isangrim and return home. Another must-read adventure from J.S. Skye! Flurry has come a long way since his journey began. He's gone up against wolves, pirates, and Jack Frost, and established himself as a hero. He's more grounded, more team orientated, and has a closer relationship with his sister, but with the same spark and innocence. The wolf Isangrim was one of the villains from the second Flurry book, and has returned completely obsessed by the need for vengeance. More of Vallidore's history and his relationship with Flurry is explored, as he devotes himself to protecting Flurry and his friends. He takes the role of almost a father figure, for he guides them and acts as their protector. Flurry and his friends are heroes. They've been in battles, saved lives, and learned to work together, but through it all Skye keeps them grounded. They may be talking teddy bears and animals, but they're still children. They miss their mom, tease each other, and view the world the innocent way children would. Betrayal is an undercurrent throughout the story as Vallidore reveals the betrayal he faced at the paws of Isangrim. But it's also seen with Boaz and Honja, as Boaz doesn't want to forgive Honja after he discovers his friend can speak their language and kept it a secret this whole time. Charming and delightful, The Assassin's Pact continues Flurry's journey as a hero, bringing him back to an old enemy and packing a lot of action, humor, and heart into another wonderful and dangerous adventure. When we last left Flurry, we saw the return of an adversary believed to have been killed. Infuriated by the teddy bear cub's continual interference, the enemy had decided to take matters into their own hands and sent Theran to hunt him down and destroy him. In the wake of his last adventure, Flurry had discovered a new purpose, the desire to help others, but not everyone believes his motives are as pure and selfless as he implies. After all, Flurry had always loved the attention, and his new heroics were earning him it in spades. Reunited with his sister, Fall, who has come to lead them home, Flurry and his team begin their latest adventure. But reaching their homeland proves more of a challenge than they anticipated; allies part ways and, with a cut-throat gang of feline assassins on his tail, Flurry must use everything he knows, and the relationships and trust he's built to ensure their survival. Join Flurry and his friends as they face dangerous odds and hidden ruins in J.S. Skye's Flurry the Bear Book 6:The Assassin's Pact. If you thought adventures on the high seas and pirates were thrilling, just wait until you cross paths with the vicious feline assassins! J.S. Skye has done it again, creating an entertaining, action packed story for the whole family. This thrilling adventure is a roller coaster of action and emotions. It is both heart-warming, and sombre, written with flair and style that will tug at your heartstrings, making it difficult not to fall in love with the cast of adorable and diverse characters and the detailed world in which they live. Another great book!